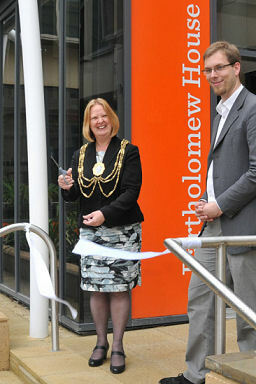 This week, The Mayor of Brighton and Hove, Councillor Anne Meadows officially opened a new council customer service facility. Brighton and Hove City Council believe that residents will get the information and advice they need faster and more easily, as they transform how services are delivered. New technology has been installed into the offices of around 500 staff to allow flexible ways of working across three of five floors of a refurbished Bartholomew House. The ground floor has been extended to create a new modern Customer Service Centre. The centre, which combines three separate centres into one and is wheelchair accessible, offers state of the art customer service features as part of the council’s Customer Promise to be ‘easy to reach’. Customers will be welcomed to the new centre by ‘meeters and greeters’ who will provide short and simple answers where possible, set up specialist interviews in one of 21 interview booths or direct them to the self help area where residents can access information online. The transformation project will deliver a 12% reduction in CO2 emissions by the end of 2013 and produce £300k cost savings each year.